I have a question about your new product Convivial House Cat. We have two cats Woody and Cleo.. Woody lately has been more aggressive towards Cleo, especially around feeding time. He keeps jumping on her, etc. Cleo is also being treated for Cancer (doing very well right now) and is taking the chemo drug Chlorambucil and also Prednisolone by pill. My question: Is there any active ingredient in Convivial which might cause any adverse effects on Cleo? Thank you for writing! I’m sorry you are dealing with a cancer – not easy. But it sounds like she is doing well and we are very happy to know that. There isn’t anything about Convivial House Cat that could or would conflict. If anything, everyone will be happier and that means everyone is healthier. It should help Woody not be so panicked about Cleo being sick. Convivial House Cat is versatile . . . you can add it their food/water, but if you have any hesitation, spray it around the house. I’m thinking that Woody is responding to Cleo’s health. You’ve probably read about those cancer sniffing dogs. Cats also smell things like cancer or other illnesses. Have you noticed that when you are on medication, especially if it’s strong, or you are around a person who’s on medication, you can smell something unusual? I think he’s smelling things which he doesn’t understand and he’s responding in a negative way – which is understandable. Why not feed one of them in a separate room, with the door shut. Let them eat (give them 30 minutes or so) then collect the food bowls. Feeding them separately brings down the tension level, dramatically. If that’s not practical for your home then move the bowls as far apart as you can. Wiping Cleo down with baby wipes might help move some of the odor Woody could be smelling. I’m working on tomorrow’s newsletter which is about feeding our cats coconut oil. One of its benefits is that it can prevent some cancers. I hope you enjoy the article. 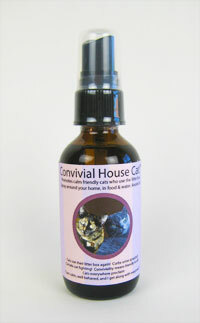 Keep me posted about how the cats do, especially if you decide to try a bottle of Convivial House Cat. When Should Your Cat See an Eye Doctor? A cat’s eyes view the world with razor sharp detail and precision, and generally a healthy cat will have good vision for all 9 lives. But things can cause loss of vision and it’s best to know what can go wrong, how it can go wrong, and where to seek out the best help. A veterinary eye specialist who has extra diagnostic skills would be your cat’s new best friend. Cat Faeries trusty feline friend Newton gives us the cat’s eye view of feline vision health, and the medical conditions which can affect it. Newton’s Purrspective – When Should Your Cat See an Eye Doctor? Have you ever taken your cat to an eye doctor? 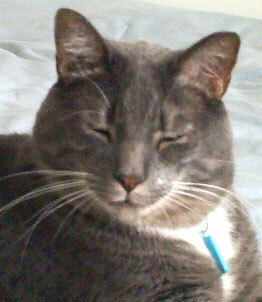 Most people assume cats have nearly perfect vision. 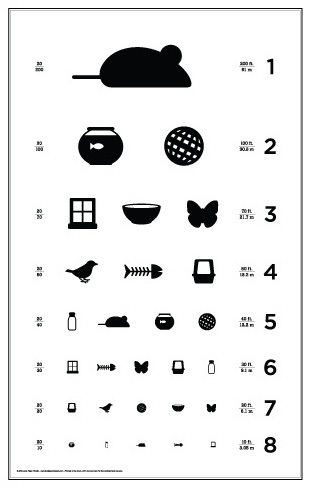 In reality their visual acuity is in the range of 20/100 to 20/200. 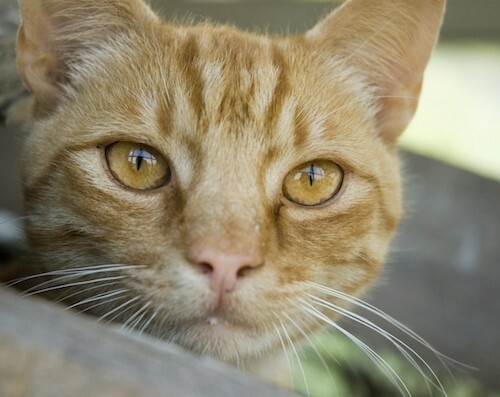 This means that what a cat can see at 20 feet a person can see at 100-200 feet. Of course, we do excel at night vision, needing only 1/6 the amount of light a human would need. http://www.businessinsider.com/pictures-of-how-cats-see-the-world-2013-10 Being nearsighted is no handicap for us at all. The real problem is the eye diseases cats get, some of which can lead to permanent blindness. An ocular discharge or pawing at the eye are clear signs that professional help is needed as soon as possible. A scratched cornea from rough play is very painful! However, some problems have no obvious symptoms and can only be diagnosed with special instruments such as an ophthalmoscope. When Kitty has an exam your vet will evaluate both eye condition and overall health. (An eye problem can be related to other health issues.) You may then be referred to a veterinary ophthalmologist for additional diagnostics and care. An eye exam should be part of your cat’s regular veterinary checkup, as well as blood tests for hyperthyroidism in senior cats. However, if you suspect any problems with your cat’s eyes please seek professional help as soon as possible. Prompt treatment may save Kitty’s sight.